When Donald Trump’s new airline, the Trump Shuttle, launched on a summer day in 1989, tuxedoed waiters with white gloves passed out smoked salmon, honey chicken skewers, and chocolate truffles. It was early in the day, but champagne flowed at Logan Airport. After a string quartet rested its bows, Trump took the microphone and struck a discordant note: He railed against Pan Am, his rival in the shuttle business. He suggested Pan Am’s flights were unsafe, that the company was strapped for cash and couldn’t spend as much to maintain planes as Trump Shuttle. Executives at Trump’s newest venture were aghast. In a highly competitive business, one in which Trump had no experience, the new boss had tossed decorum to the wind and made claims he had no evidence to support. 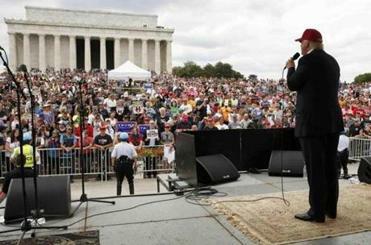 Speaking in Washington, Donald Trump said he would improve the services that veterans receive. Echoes of Trump Shuttle reverberate in the Trump presidential campaign. He bashed his rivals with scant justification, grabbed media attention with flash and dazzle, and relied on gut instinct to pursue strategies that flouted industry norms. 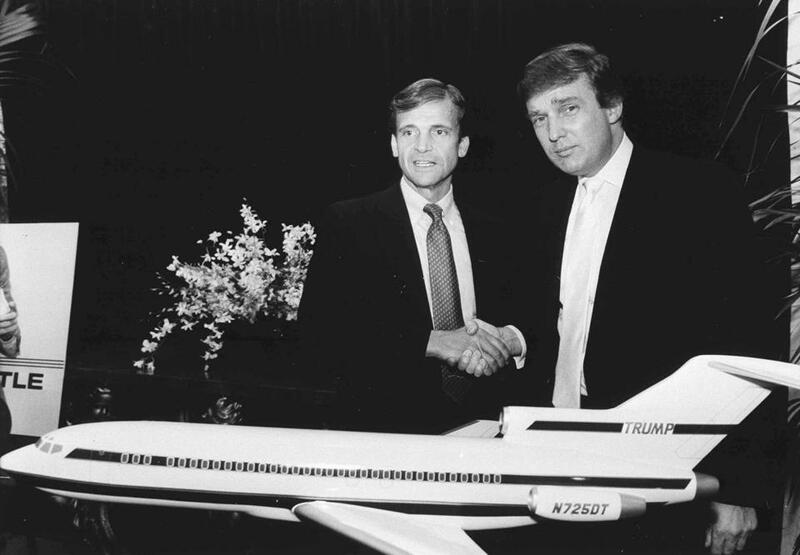 But while Trump broke into the shuttle business with typical bravado and brand mastery, he was brought low by a series of missteps and a softening economy. His lack of expertise in East Coast skies took a toll, and he was forced to give up the airline after less than three years. And Trump’s unfounded remarks about Pan Am safety? They almost immediately came back to bite him. Trump’s own airline was struck by a near-tragedy within its first three months, when the nose gear failed on one of his jets and forced a crash landing at Logan. Despite its short, rocky life, Trump today blames outside forces for its demise and maintains the Trump Shuttle was a qualified success. Donald Trump shook hands with Frank Lorenzo, from whom he bought Eastern Airlines’ profitable Northeast air shuttle. Eastern Airlines owner Frank Lorenzo was at a party at the Metropolitan Museum in New York when he spotted Donald Trump. Lorenzo’s airline was struggling and needed an infusion of cash. The company’s decades-old shuttle — which transported white-collar businessmen and women between Boston, New York, and Washington — was the quickest source of revenue. Lorenzo had never met Trump, but he did know something about the businessman: He liked New York icons, and the shuttle flight was a well-known icon. Trump had recently purchased the Plaza Hotel in New York and was about to seal a deal for the Taj Mahal Casino Resort in Atlantic City. Over breakfasts at the Oak Room inside the Plaza Hotel — and during an outing on Trump’s yacht with their families — Lorenzo and Trump negotiated the sale of the shuttle fleet, airline terminals, and equipment. They settled for $365 million. Even at the time, Trump was widely believed to have overpaid. When his team added up how much it would cost to start such a carrier from scratch, they estimated around $300 million. Still, they calculated that if he got about 60 percent of the market share, he could easily pay off the debt. The day of the grand opening, Trump himself flew to each of the three cities served by the airline. Passengers got a half-liter of champagne and long-stemmed roses. At Logan, one of the first passengers happened to be the renowned ballet dancer Mikhail Baryshnikov. It was nice but, some thought, too much. But many of the employees were thrilled. Under Eastern Airlines, they had been on strike, and Trump hired many of them to work at his airline. He also didn’t cut pay or seniority. Trump initially could not contain his excitement over his new toy. He was also asked about what it was like to fly on his own airline, looking down at his properties below. It all struck even some of his own employees as a bit much. On airplanes that were worth about $4 million each, Trump spent about $1 million apiece to redesign them. He wanted a T on the tail of the plane as big as possible. A giant TRUMP was painted on the side. Trump also designed new uniforms that, for the flight attendants, turned out to be impractical. “We had this pretty white blouse that showed a little cleavage,” said Catalano, the former flight attendant. “You can’t have that kind of a uniform. As a flight attendant, you’re bending down or picking things up. Trump wanted the planes to feel like a private jet. The wood panels were made of bird’s eye maple. The burgundy carpet was the most plush in the business, but it was too thick: The center panel had to be ripped up after flight attendants struggled to push drink carts down the aisle. In the lavatories, Trump — who relied on an adviser who had helped design his yacht — wanted the sink to be made out of real marble. After being told the fixture would be too heavy, faux pink marble was used instead. The lights installed were bright makeup lights, not the dim fluorescent that most planes had. The sinks had an automatic sensor to turn on the tap. To some at the time, it all seemed a bit lavish. The flights only lasted for 45 minutes, and most were using them to commute to business meetings. Surveys of passengers found the three most important things to them were schedule, reliability, and the frequent flier program. Trump’s rivals also used the excess to their advantage. Pan Am launched a $5 million advertising campaign apparently spoofing Trump and debuting their new spokesman: Milburn Pennybags, the tycoon from the game Monopoly. “On which shuttle will you find the world’s most famous investor in real estate, hotels, and transportation?” the ads asked. Trump now says he has no regrets and doesn’t feel like he overspent on the planes. Trump wasn’t involved in the day-to-day management of the Trump Shuttle. But he often weighed in on decisions around brand. He was very aware that it was his name on the airplanes. Trump didn’t know the airline industry, but he did know about what high-end clients might want. Few details were overlooked, from a concierge waiting at airline terminals, to helicopter rides from the financial districts of New York or Boston, to thank-you letters on Trump-branded stationery signed with an autopen that used the same blue felt pen Trump had in his office. The airline also played on the power corridor during an ad campaign, attempting to illustrate how it attracted a select set of passengers. One ad starred former House Speaker Tip O’Neill and former Secretary of State Alexander Haig. In television and print ads, the political odd couple appeared together, disagreeing on almost everything except one thing: They liked the Trump Shuttle. Trump also had a drawn-out argument with the shuttle president over a cross-promotional idea. Trump wanted the airline to hand out casino chips to every passenger, trying to encourage them to go to his casinos in Atlantic City to redeem them. Nobles said he told Trump repeatedly that the shuttle flight passengers were not typical casino-goers. They were businesspeople. And they wouldn’t make a decision to purchase an airline ticket based on a casino offer. But Trump was persistent. Nobles relented and approved the distribution of casino chips. A Trump Shuttle plane made an emergency landing at Logan Airport. Less than three months after Trump took over the airline, he was sitting in his office one August morning. Some of his shuttle employees, who also worked in Trump Tower, came into his office. Trump — who weeks earlier had made claims that he would send all of his own planes through X-rays to make sure they were safe — turned on the TV and watched as CNN showed a Trump Shuttle flight circling the air. After several attempts to jar the nose gear loose, and after circling around to burn fuel, the pilot landed on the back two wheels, slowing the plane down as much as possible before lowering the nose of the plane onto the runway. Nobles immediately made plans to fly up to Boston, and Trump said he wanted to go, too. Rather than fly his own jet, they both got on the next Trump Shuttle flight. The front page of The Boston Globe after the August 1989 incident. Trump helped ensure a day that could have been disastrous instead focused on the heroic work of his employees. He turned a bad story into a good one. The “maestro” that day, pilot Robert Smith, said Trump had been advised not to come up — so as not to draw attention to the crash — but Trump disregarded it. An investigation found that years earlier — and well before Trump took over — a mechanic had used the wrong part in the gear mechanism, and it eventually disintegrated and locked the gear in place. One of the passengers on that flight — who recalls sliding out the aircraft and into a pile of foam — was Mike Murphy, a veteran Republican strategist who worked for Jeb Bush and his super PAC to try to defeat Trump. 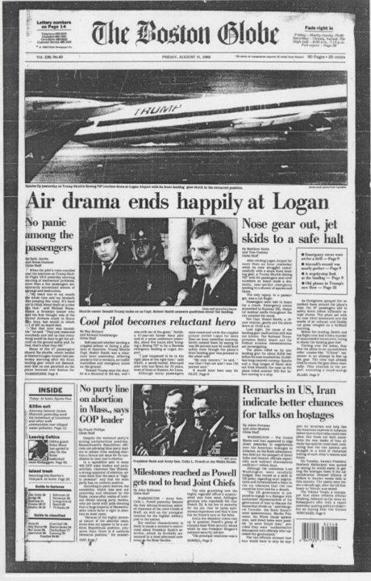 The Eastern Airlines Shuttle flight had been a reliable source of revenue for decades. Since the 1960s, the number of shuttle flight passengers had grown every month, without exception, until November 1989, Nobles said. It dropped. Then it dropped again in December. A recession was coming. As a result of the Gulf War, the price of oil — and, therefore, jet fuel — had jumped. The Trump Shuttle was successful enough to cover operating costs but not enough to pay down the debt. It fit a pattern for Trump: making a bet that his product would be so successful that he could pay down massive debt and earn a hefty profit along the way. It was the model he attempted in Atlantic City, and the one he was also trying to execute with the Plaza Hotel. 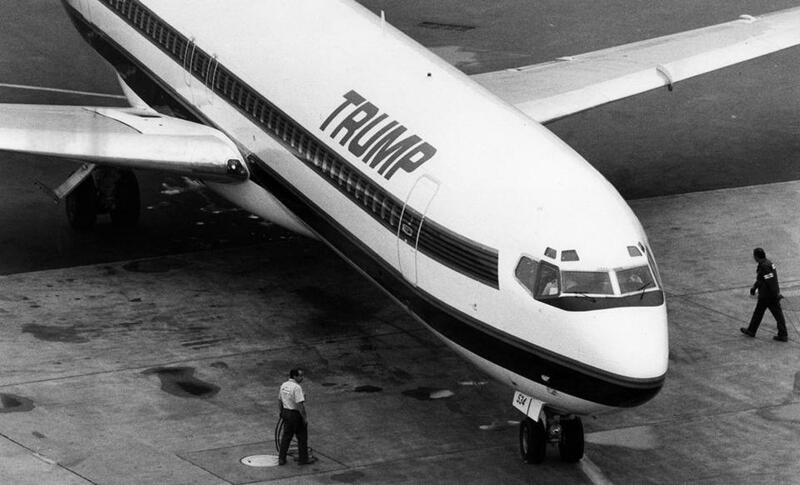 About a year after he purchased the airline, Trump began openly discussing selling it. He fired Nobles and laid off 100 employees, which amounted to about 10 percent of the workforce (Trump had also explored having two pilots fly the planes, but Nobles said he was insistent that less than three was unsafe). Free coffee was no longer served in the terminals, and the concierge service was suspended. Over an 18-month period, Trump couldn’t turn a profit. The Shuttle had lost $128 million. Soon after, US Airways began operating the flights, quickly stripping Trump’s name off of everything. US Airways bought the shuttle from the banks in full in 1997, when it was valued at $285 million. At the end of the day, Trump maintains, he did not lose any money in the venture. And the only lesson he learned, he said, was that he knew when to walk away.